A Blog Module for ProcessWire consisting of a backend Blog manager (ProcessBlog) and a frontend Blog generator (MarkupBlog). The Blog Module for ProcessWire replicates and extends the popular Blog Profile. ProcessBlog: Manage Blog in the backend/Admin. MarkupBlog: Display Blog in the frontend. BlogPublishDate: Automatically sets a publish date when you publish a Blog Post. As a module, Blog can be installed in both fresh and existing sites. ProcessBlog: Manage Blog in the backend/Admin. MarkupBlog: Display Blog in the frontend. BlogPublishDate: Automatically sets a publish date when you publish a Blog Post. Dashboard with quick stats about your Blog. Full view, create, edit, delete, update (CRUD) Posts, Categories and Tags within a single interface. Fully uninstall/cleanup Blog templates, fields, pages and optionally template files. Easily output your Blog in the frontend, where and how you wish (e,g, only output part of the Blog). Use any CSS framework (or not!) you wish. PocketGrid CSS included with the demo Template Files (fully responsive). A. Configure Blog settings in its module's configuration screen. B. Install Blog Templates, Pages, Fields, Role and optionally Template Files. In this second step, via the Blog dashboard (admin/blog/), you will see an overview of the settings you selected in the first step above. Here you install Blog's components. Before you click the button to run the install wizard, nothing will happen yet. You can still go back and change the module configuration settings. Until you run the install wizard in this second step, you will have no Blog Pages, Fields, Templates, etc. On this page, you will also be able to rename your Blog’s main pages before they are created. If you don’t do it at this stage, you can also rename them post-install in the ProcessWire pages' tree. If you are happy with your settings, click the install wizard to proceed. Blog will be fully installed with your settings within a few seconds and you will then be presented with the Blog dashboard. Only Templates, Pages and Fields necessary for your selected 'Blog style' will be installed. For instance, if you did not enable the commenting feature, related Templates, Pages, etc. will not be created. Note that non-enabled features cannot be enabled once the second part of the install is complete. However, using the 'Cleanup' feature (see below) you can return Blog to the first-step of the installer stage and enable a feature you want or even select a different Blog style. If you chose to install the demo Template Files, also manually copy over the /css/ and /scripts/ folders present in Blog module's folder to your /site/templates/ folder. If you need to change some configurations, you can go back to the module settings and do it BEFORE you finalise step two of the installation. It is important that once the installation is finalised, in case you had left the ProcessBlog's module configuration's browser window open, NOT to press submit again. Otherwise, MarkupBlog may not function as expected. However, if you reload the module configurations screen once the second-part of the installer has finished, you will not be able to change the configuration settings. Instead, you will be presented with an overview of your installed settings. The module Dashboard will not work with Blog Profile installs! 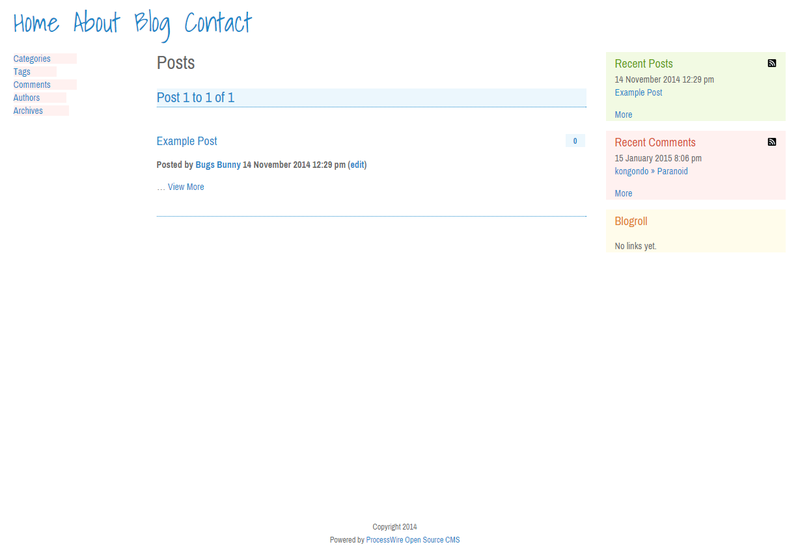 MarkupBlog replicates the Blog Profile. Hence, the 'items' Fields, Templates, Template Files and a couple of Pages are installed where such, with similar names, do not already exist, i.e., installation is non-destructive. With the exception of Template Files, note that if even one item with a similar name (and path for Page items) already exists on your site, NONE of the items will be installed. Instead, step two of the installation will be aborted. For Template Files, if you did not select the 'no template files' option, these are only copied over to /site/templates/ where no template with an identical name already exists. This means that no Template File gets overwritten. Fields and Templates are prefixed with blog_ and blog- respectively. The module also adds 3 Fields (biography [blog_body], image [blog_images] and title) to the user template. These are needed for the Blog Author biography. Role blog-author and permission blog are created on install. Until you set 'author titles' for your Blog Authors (in Admin > Access > Users), a generic 'Author Name' will be used as their display names. In order to use the Recent Tweets Widget, you will need to separately install and setup the module MarkupTwitterFeed. Uninstalling Blog is a two-step process. If you are logged in as a superuser, you will see a Blog menu item called Cleanup. It will lead to a screen with info about all the Fields, Templates, Pages and Role you are about to delete. It will also list the Blog Template Files that, if you wish, you can also delete. This utility is also useful when you want to try out the different Blog styles without uninstalling the whole Blog module. It returns Blog to the state similar to when you first installed the module. Of course, in case you want to remove Blog as well, just go ahead and uninstall in the normal way but AFTER you have cleaned-up. Better sorting of Posts, Categories and Tags in their dashboards. New option for posts: post_edit. Allows top or bottom placement of link to edit post for logged in users or non-display of link for all users. Fixed sql error thrown when comments disabled and accessed blog dashboard. Added capability to copy demo JS and CSS files on blog install as well as remove them on uninstall. Full compatibility with ProcessWire 2.8.x and ProcessWire 3.x. See PR. Fixed bug where comments' date was being output as a raw timestamp (owing to a miss during the last commit). Fixed bug where comments' date were not being correctly output. All MarkupPageNav (used in renderPosts()) options can now be passed to renderPosts() to customise pagination of posts. Added option to use Rich Text Editor (CKEditor) in Quick Post. Setting is configurable in ProcessBlog module settings (both pre- and post-install). Fixed issue where dashboards were loading very slowly on sites with lots of posts. Added some missing translation strings. Preserve all line breaks as paragraphs for posts created via ProcessBlog's quickpost. Added a very visible reminder in Blog's module configuration screen not to uninstall the module BEFORE running the in-built Cleanup Utility. Fixed Posts/Categories/Tags dashboard html rendering issue on multilingual sites. Added 'post_small_tag' option to renderPosts() to specify html tag to wrap summary blog posts (small). All main methods that render HTML output are now configurable via a parameter/argument $options. Minor updates to demo template files. Fixed a comments' visibility issue. Enhancement to comments' visibility status (added status HIDDEN). Four Blog styles (URL structures). Cleaner utility (for Blog fields, templates, template files, etc.). Added new small autoload module BlogPublishDate as part of the Blog module suite, that saves a Blog Post's publication date. Enhancements to Posts, Categories and Tags Dashboards: Customisable number of posts/categories/tags to show per page (via a drop-down select). Selected value is preserved via a cookie per context (i.e. can have different values for posts, categories and tags dashboard) and per user. Date column: shows 'Pending' for unpublished posts (never before published ones), 'Expired' (published then unpublished posts) and published Date for currently published posts. Date shown is formatted according to the format set in 'blog_date'. Fixed sorting by date column. Changes to renderComments(). Added a 4th Array $options argument for customising the texts describing the various comments' statuses. Added comments visibility settings at post and global level. Added new widget 'Post Author'. The widget allows to add a post's author's biography with each post (above or below the post). Made 'posts truncate length' configurable. Please refer to this post for full instructions and an upgrade script. I would've paid money for this. Hi, I am new to Process wire and I have been learning from the tutorials. I am trying to include in the blog post a file, like an attachment and an image, I already include the fields in the template and to addd them in the backend but when I am trying to display it in the front end, how can I do this? Which php file do i need to update?any direction will be greatly appreciated. Please ask your questions in Blog's support forum (see link above). I am not able to offer support here in this limited space. Hi there, Thank you for Process wire. I have just about started learning it. Have a question already though. Suppose i want a 5 or 6 pages (brochure site) + a blog which should be available from main menu on a shared hosting. Which profiles should i use and how to go about it? is there a update availiable for processwire 2.6? It works with 2.6. Updated info here. Hi, do you plan to adjust your bolg module to PW 3 release? I guess this will be a good thing. If you like to do it, you may contact me if I can help you. I will be testing it in PW3 and adjusting it if necessary. However, I will not namespace it. I will let ProcessWire's compiler handle compatibility with PW3. Hi, I try Bolg on PW3 and I guess that your module have problems with the namespace in PW3. The error I got indicate that the Comment class can´t be found. Therefore, I will try it with the new 2.8 relase branche which is PW3 without enabled namespace. Hope this will solve the issue. Ralf, please post issues in the module's support board. I am not able to offer support here. Thanks Kondongo. This is truly amazing! It would be great to see some of the updates given in the forum posts compiled with the rest of the user docs. For instance, using the $options parameter and in particularly using the featured image option.